I was in a session last week where the presenter remarked, "Once you've used a Mac you'll never go back." Well, that wasn't true for me. I went from Windows to a Mac back in 1995. I purchased a PowerBook 5300. I didn't stick with it long. It was almost always broken. I can't even remember how many times this machine went in for service, but it was a lot. I would also mention that the operating system, System 7, was every bit as borked as Windows. It had these things called "extensions" that routinely broke, and required massive amounts of trouble-shooting. My whole Apple experience totally sucked. 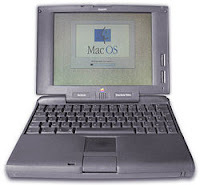 Although a significant advance over preceding portable Macs, it is quite common to see the PowerBook 5300 series listed as among the worst Apple products of all time. Couldn't agree more. I came back to Apple in 2001. I didn't come to the Macintosh from the typical migration path. I came to it from Linux, and only made the move because Apple had abandoned System 7 for Mac OS X. It was the Mach kernel developed at Carnegie Mellon, that Steve Jobs used in his failed NeXT experiment, combined with some other Unix goodness under-the-hood that brought me back. Unix was stable. Unix flat worked. Unix came to its complexity through years of open-hacking. It was this openness which made Mac OS X possible. I think people are so enamored with the simplicity of Apple designs that they sometimes forget what really is responsible for making it all work. Apple didn't create the core of their operating system, they took what was freely available, and introduced a series of incremental innovations. It took 13 years from the release of the NeXT computer until 2001 before Apple had a truly remarkable product. Maybe the better description of the whole Apple phenomena would be, "Once you've used a really good Unix OS you'll never go back." Which is exactly why people need to keep their eye on Google. We need to remember how most disruptive innovations actually happen: A Google OS by 2010? No, You simply drank more Apple kool aid from that fountain again. Apple products were, and will always be over rated, over priced garbage. OSX is fine!, the computer is fine. But at the price they sell it for, it makes it not worth it. The way they have to make fun of their competitor just to gain market share with dishonest smears is also another reason I've stayed sober from that fountain. But most of all, I can always be assured a PC that's faster, runs more titles and cost less than any Apple product. I have a new Intel i7, at 4ghz with full DDR3 ram, a 1 terabyte HD, and it all cost me $750. It's way faster than what you get with mac. I'd also say you are consumed with the OS, unix, linux etc, blah, lol. From that perspective you might like it, but let's face it, the OS is meant to be an operating system to help you do your day to day tasks. Anyone getting in that deeply is over analyzing it all. But go ahead, have another drink, since you are obviously drunk with the whole thing.